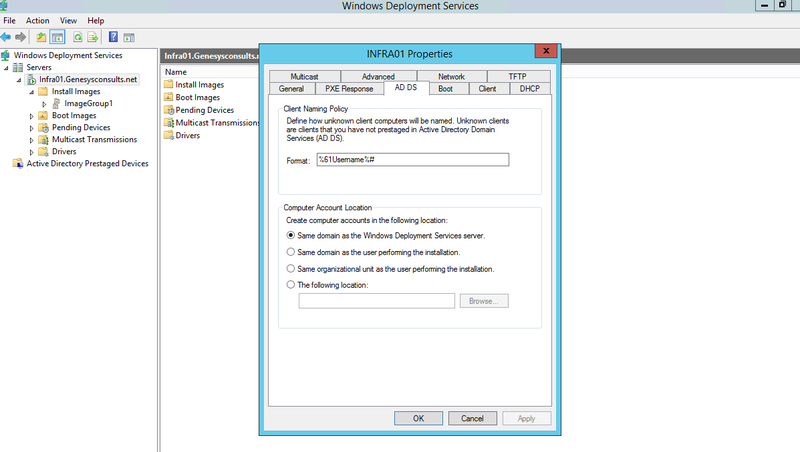 Setting Up a WS2012 R2 Windows Deployment Server (WDS) for Pre-Boot Execution Environment (PXE). | Chinny Chukwudozie, Cloud Solutions. ← Using NTDSUTIL Metada Cleanup to Remove a Failed/Offline Domain Controller Object. As indicated in the screenshot, a restart is not required. 2) Copy the specific Operating System ISO file to any location on the Deployment Server. 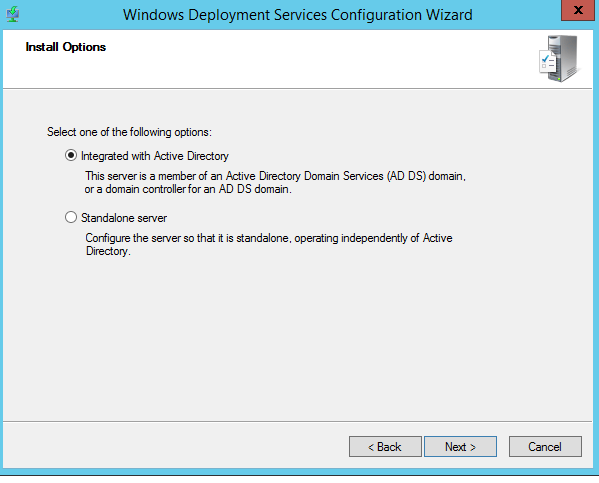 Click next and select the option to integrate with Active Directory. I selected this option simply because it suits my environment. 4) On the next page, I decided to keep the default remoteinstall folder path. Ideally, you should change this to a different volume. 5) On the PXE Server Initial Settings page, I selected the :Respond to all client computers option. 6) At the operation complete page, I unchecked the ‘Add Images to Server now’ checkbox and clicked on the finish button. 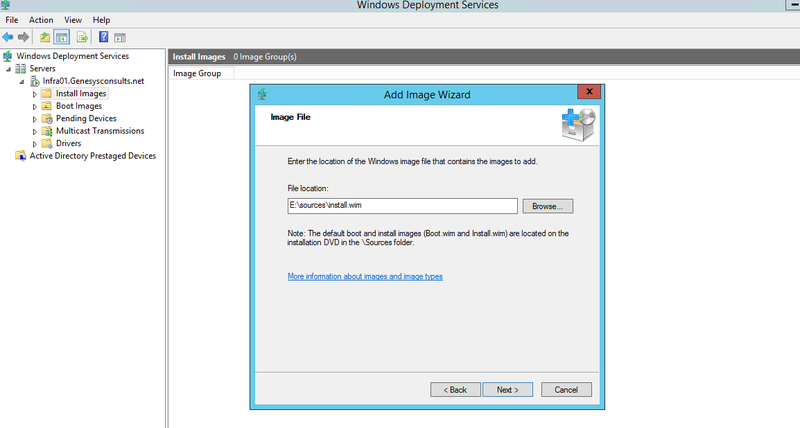 7) The next step is to add the install image file (install.wim) . This file can be found in the sources subfolder of the OS folder. Since I have an iso file, I mounted the file as a DVD drive and browsed to the location of the install.wim. 8) Click next to select and add the appropriate OS images. After the install images are added, click the finish button. 9) Next step, we’ll right click the Boot Images folder and select ‘Add Boot Image’. 10) Browse to the location of the boot.wim file in the sources subfolder as above, select and click next. 11) At the ‘Image Metadata’ page, edit the descriptions as needed. Click next to verify your settings and finish after task completion. 13) A Microsoft Windows DHCP Server is already in place, so this deployment is ready to go. Physical client machines can be made to boot directly to the PXE/WDS Server by using the F12 key or any preconfigured key. Microsoft virtual machines will require a Legacy Network Adapter to boot to the PXE server. This entry was posted in Active Directory, Active Directory Domain Services, DHCP, PowerShell, PowerShell 3.0, Powershell 4.0, Pre-Boot Execution Environment, PXE, Virtual Machines, WDS, Windows Deployment Server, Windows Server 2012, Windows Server 2012 R2 and tagged Legacy Network Adapter, PXE, VM, WDS, Windows Deployment Server. Bookmark the permalink.